Can the Anti Photo Radar Club Defeat Radar Cameras? 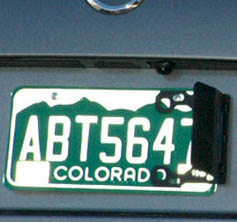 Photo radar camera's violation photo of Colorado plate and Anti Photo Radar Club. Anti Photo Radar Club rated "ineffective"
The Club is a black flap of ABS plastic bolted to the end of the license plate. It creates a vertical shield claimed to partially cover the plate when viewed from the side. We found that at the standard photo radar 22-degree angle it covered much of the last number, but not enough to prevent identification. Only at a 35 degree-plus angle would it blank out the digit. It's unfortunate that black material is used for the Club; something translucent would be far less obvious. Driving around with the Club is like dangling a sign: Attention, officers: Ask me about my photo-radar countermeasure!